A volunteer park ambassador at Valley Forge National Historical Park discovered dozens of fossilized dinosaur tracks that date back millions of years. The national park on the site where George Washington and the struggling Continental Army endured a tough winter during the American Revolution boasts a new feature that's a couple of hundred million years old — dozens of fossilized dinosaur footprints discovered on rocks used to pave a section of hiking trail. The trace fossils, as they are known, are scattered along a winding trail at Valley Forge National Historical Park, on slabs purchased in 2011 from a nearby commercial quarry. To the untrained eye, they appear as indistinguishable bumps in the sandstone rock, with the largest about 9 inches long. On a recent weekday, hikers, joggers and dog walkers used the trail, oblivious to the marks of prehistoric animals beneath their feet. Those marks drew the attention of Tom Stack not long after he began working as a volunteer park ambassador at Valley Forge in 2017. Fossilized dinosaur footprints and a non-dinosaur reptile, lower right, a relative of the modern crocodile, on paving stones at the Valley Forge National Historical Park in Valley Forge, Pennsylvania, on Feb. 28, 2019. A volunteer at the park outside Philadelphia recently discovered dozens of fossilized footprints on flat rocks installed to pave a section of hiking trail. Stack, who has a background in geology and paleontology, recognized the approximately 210 million-year-old rocks known as argillite as being similar in age and type to fossil-bearing rocks used to construct a 1930s-era bridge on the Gettysburg battlefield, about 100 miles to the west. 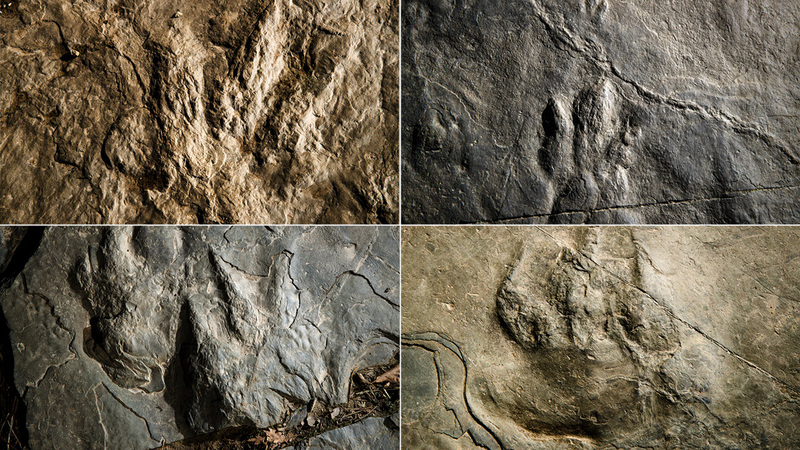 Most of the tracks left in what were once muddy flats consist of three-toed foot impressions from the early days of dinosaurs, although Stack also found footprints from a non-dinosaur reptile, a relative of the modern crocodile. The largest would have been a bipedal theropod that was 6 to 9 feet long and 4 to 6 feet high. "They're subtle, they're not easy to spot, but once you learn the characteristics of them, given the right sunlight angle and, at times, the moisture on the rock, then they are easier to identify," Stack said. There are also distinctive patterns in the rock thought to be caused by the cracking of dried mud, and from the ripples of a lake or river. The National Park Service requested the exact location of the rocks not be publicized, to help protect them from being damaged or removed. Officials said visitors will be told about the rocks and how park resources are protected, but not where to find them. The 5-square-mile park has about 30 miles of trail. The dinosaur footprints Stack found are not unique or even particularly rare, and don't add to the body of scientific knowledge about the creatures, said National Park Service paleontology program coordinator Vince Santucci. They date from later in the Triassic period and before the Jurassic era that's so familiar to moviegoers. "There's no question that they are" dinosaur trace fossils, said Santucci, who examined them in person last April. "They're consistent with the tracks that occur in equivalent-age beds all over the East Coast." More than 270 National Park Service properties contain some sort of paleontological resource, from Dinosaur National Monument in Colorado and Utah to the fossils scattered in rock used to build the Lincoln Memorial and Capitol Reflecting Pool in Washington, D.C. Most fossils found on Park Service land are still where they were discovered, in the original bedrock location. But others were moved by human activity, including a set of burrows from an ancient species that appear on the rock facade of a visitor's center bathroom at Valley Forge. Those rocks originated outside the park. There also happens to be a significant Ice Age fossil location beneath the Valley Forge park, the Port Kennedy bone cave. First discovered in 1871, it has produced fossils that include giant tapirs, ground sloths and saber-toothed cats. Port Kennedy is considered one of the most important mammal fossil sites in North America, with some findings having been displayed at the park visitor center, although most are at the Academy of Natural Sciences in Philadelphia. That 750,000-year-old site was lost after a quarry was filled — partly with asbestos — before being rediscovered by scientists in 2005. It is not accessible to the public. There are at least 35 Park Service properties known to have fossil tracks of ancient vertebrates, and vandalism and theft have been a problem. Federal law prohibits visitors from disturbing park elements. A park spokesman said there have been preliminary discussions about developing an interpretive program to give visitors information about the trace fossils. Stack said the park should consider removing rocks that contain the best fossils, to prevent damage or theft. "I would think they are of value as an educational tool," said Helen Delano, a senior scientist with the Pennsylvania Geologic Survey. "Dinosaurs are a wonderful way to hook people into paying attention to the geological environment. Every kid loves dinosaurs." Stack said the rocks are abundant, cheap and durable, so they have long been used for paving, sidewalks, garden walls and similar features in the Philadelphia area.